Duck calls come in one basic shape with infinite variations. When looking at a wall of calls in the sporting goods store, occasional hunters will either be intimidated or lust after several of the calls. Life experience suggests that some of the calls will be subpar and some might be way more than you need to call ducks. How should a novice or intermediate level hunter choose from 20 or more options? How much duck call do you need? Do the $150 calls outperform the $15 buck calls? There is generally one type of duck call: the mallard hen call. After that there are duck whistles and wood duck calls. Don’t worry about whistles and woody calls till you know if and when you need them. Mallard hen calls are the standard and they come in two basic styles. Double reed calls are considered the most forgiving and easy to blow. Many serious hunters prefer the double reed calls, which produce consistent quacks and hail calls. Double reeds lack only in the tone range of single reed calls. Haydel’s dr85 is the old time standard, inexpensive double reed. The Primos “Wench” is a modern adaptation that is still fairly inexpensive and easy to operate. 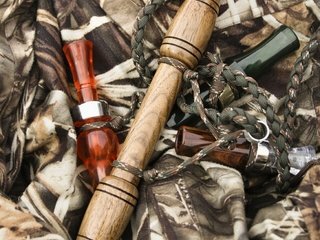 Single reed calls are the preferred calls of many serious duck men. Although they are a little bit more difficult to tune in, single reeds properly tuned and used are very close to real duck calls. These also have the ability to produce a wider range of duck sounds. Great base model single reeds include the RNT quackhead (in poly) and the Echo poly single reeds. Polyurethane is the standard for the less expensive single reeds. Poly calls produce excellent low to mid range duck noises very consistently. Hand turned hardwood calls are the next step up. Many hunters prefer wood calls because the aesthetic seems nicer. Highest in price and range are the single reed calls made from high density acrylic. Acrylic is very dense and consistent which makes for great noise predictability and range. High range, long distance calls that are difficult to produce on wood or poly calls are well within the top end range of acrylic. Mallard hen calls can be tuned for high end “open water” or for low end “duck” or “timber” calling. Timber calling refers to the close in calling work used to call birds in flooded oak flats. Good low end calling is important for finishing birds. Luckily low end calls can be made using any good double or single reed calls. In fact high dollar acrylic calls tuned for high end work are somewhat tougher to make “ducky” low end noises on. This makes the entry level double reeds and the poly singles perfect calls for intermediate level callers.